The Sega Saturn was originally scheduled to launch on “Saturnday” September 2nd, 1995, but Sega of Japan insisted on an early launch to get the jump on Sony’s Playstation, also launching that fall. On May 11th at E3, Sega of America CEO Tom Kalinske announced that the Saturn was available immediately at select retailers, 4 months earlier than planned. This meant that not only was the console being rushed out the door, but the launch titles, as well. The two marquee titles at launch were Virtua Fighter (the pack-in), and Daytona USA. Both were strong releases, but both suffered from a shortened development cycle. To “make up” for this, Sega almost immediately re-worked both games for re-release. Sega-AM1 was tapped to develop Virtua Fighter Remix, which was given free to all registered Saturn Owners. Sega-AM3 was responsible for developing an improved version of Daytona, as they had already created a nearly arcade-perfect home port of Sega Rally Championship. In theory, Daytona USA Championship Circuit Edition is what the original Saturn release should have been. This release fixes some of the graphical glitches, increased the frame rate to 30fps, and added 2 new tracks and 7 new cars. It also added a 2-player split-screen mode. 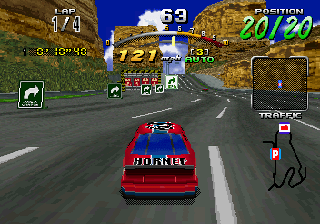 The “Saturn Mode” was removed and replaced with “Time Attack” mode, in which the player races against the clock instead of other drivers. This mode is great for practicing but also presents a challenge different from normal racing. The selection of cars is a great addition, as each car has its strengths and weaknesses. This adds to the replay value as players will spend a lot more time trying to master each track with the different cars. The two new tracks, National Park Speedway and Desert City are both welcome additions, but National Park Speedway is easily the better of the two and might be my favorite track in the game. The game still includes three race modes (normal, grand prix, and endurance), and the difficulty settings have been scaled back from 5 levels to a more reasonable 3. This game is definitely easier on the normal difficulty setting, and I am able to consistently place in the top three, whereas in Daytona USA I had a hard time doing so on a regular basis. Championship Circuit Edition also features an extended soundtrack, including remixes of the songs from the original game. This version supposedly fixed some of the problems with draw-in, but it still looks pretty bad to me. Still, it doesn’t effect the core gameplay and really isn’t a bother. It sounds like this game is an upgrade in every way over its predecessor, and I guess on paper it is. But something about the game just doesn’t feel right. I’ve played a lot of the original release and spent my share of time on the arcade machine, and something about Championship Circuit Edition just got lost in translation. I gave both games the same numerical score because I feel like the pluses and minuses of each are a wash. Which one you should buy really just depends on your history with the game. Buy Daytona USA Championship Circuit Edition on GameGavel or Amazon. Tagged 1996, Arcade, Championship Circuit Edition, Daytona USA, Racing, Review, Saturn, sega. Bookmark the permalink.